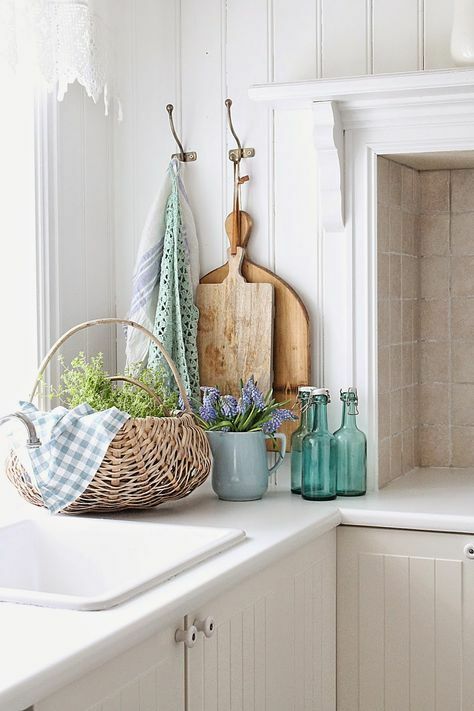 Today I wanted to share 5 tips to creating pretty vignettes, because up until recently, this concept of arranging items to create an appealing, beautiful display was a mystery to me. I liken them to messy buns, they're both meant to look effortless, yet we all know in reality they take a lot of practice until they look pleasing to the eye. With just a few pointers in mind, you can be on your way to creating designer-worthy vignettes all over your tabletops, dressers, and shelves. Editor's Note: I do not consider myself an expert when it comes to interior design. These are just tips that I have gathered along the way that have helped me be a little more confident in my vignette styling. Also, I don't believe in "rules" when it comes to decorating YOUR home that's why I've labeled this "tips" and not "rules". You do you, boo! Grouping items in even numbers, apparently isn't as eye-catching. 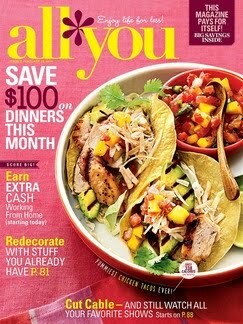 To create visual interest, display similar items in odd numbers. The number three has long been a highly respected digit among the design world. Groupings of "five" is another favorite as well. I always remember the "Rule of Odd" whenever I'm working on creating a vignette. Below is an example of a fall vignette I recently shared on Instagram. 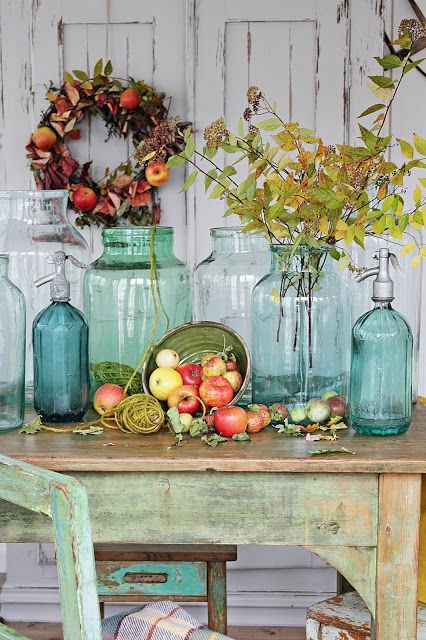 You'll see that I utilized three similar looking blue glass jars and pumpkins/squash through out my display. They're similar in shades and texture so they play well off of each other. Varying heights within your vignette, helps it look well-balanced, however, you want to aim for gradual height among your objects. If you have a really tall lamp next to a mini picture frame, the empty space in between will look awkward. When creating a vignette,you want to try to stagger your decor items to create dimension. Lining them up in a straight line on the flat surface you're working on will make it appear flat. Cooties don't exist in the vignette world! Group some items together, have them touch (like my pumpkins and squash above). 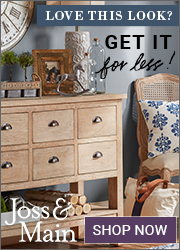 Spacing items away from each other equally all over your coffee table or dresser will look odd! When it comes to arranging vignettes, there really is an art to it, but editing and re-editing your display until it feels just right is all part of the fun! Want to know what my favorite tool is when it comes to creating pretty vignettes? My camera phone. There's something about viewing your home through a lens that gives you additional insight into things that look awkward or off! I also love to study other people's pictures of vignettes on Instagram and Pinterest. Vibeke Designs is the queen of gorgeous vignettes (as demonstrated in the pics above) and I have found myself lost on her feed for hours many, many times. By keeping some of these tips in mind, with a little practice and a little inspiration, you'll be on your way to achieving stylish vignettes all over your home! Now go get decorating! Sharing at the following link parties. This was very interesting. I am going to save this post for future reference. Have a great week ! 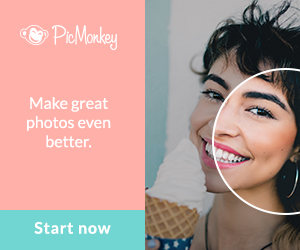 Jennifer- your vignettes are stunning, as are your photos. FYI- the rule of three comes from nature (leaves tend to grow in three's or berries as three on a branch, etc.) and that is why we find it visually appealing. If I recall correctly from my college days (my undergrad degree is in interior design)- the groups of three should be immediately near each other (almost touching)- not counted on one shelf or counted on an entire cabinet. 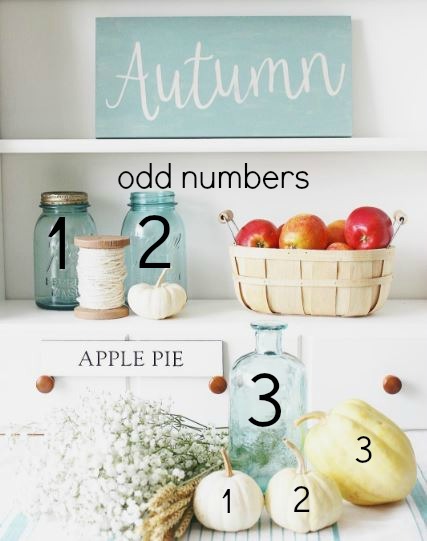 So your two mason jars with either the yarn or the white pumpkin would actually be your 1-2-3 (so for this to be the true rule of three, you would take one item away from this grouping). Your basket of apples can still be on odd by itself as 1 item off to the opposite corner, as long as it is set apart with a bit of space. By no means am I judging or pointing out any imperfections in your set up- just helping you to convey this information correctly to your readers. I find rules should be broken anyway and I think your vignettes look amazing to me. I so wish I had your photography skills! Hi, Jill! Thanks for your info. I love learning and in no way consider myself an expert! I've seen varying advice when it comes to the "Rule of Three". In some examples, I've seen the 3 grouped together and some not. I totally agree with you on rules should be broken and you should do whatever you think looks pleasing to you! I really love the tidbit on "nature" and where the rule of odds came from. VERY interesting and it makes sense!! Thanks for sharing!